BTCUSD forms shooting star and hanging man at $3,976.10 and $3,972 levels respectively. The minor resistance levels are observed at near $3,900 - $4,100 and the major resistance near $4,627 levels. The minor support areas are observed near $3,964 and $ 3650 levels. The price is trading in a stiff range between 7-SMAs and stiff resistance levels. 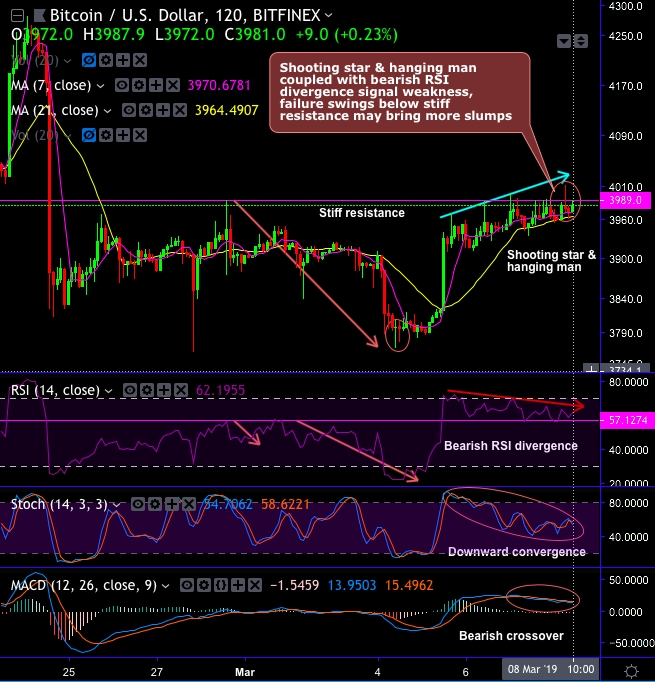 Please be noted that the bearish RSI divergence has been observed in the medium and short-term. Shooting star & hanging man coupled with bearish RSI divergence signal weakness, failure swings below stiff resistance may bring more slumps. Intermediate trend breaches below range & retraces more than 78.6% Fibos with bearish EMA & MACD crossovers, bearish pressures imminent as the current price well below EMAs. Overall, we could foresee the minor hiccups in the bitcoin price trend, but the major trend has been attempting to consolidate. On hedging grounds, it is wise to stay long hedge in CME BTC futures of mid-month tenors rather than holding underlying bitcoins. Currency Strength Index: FxWirePro's hourly BTC spot index is flashing 183 (which is highly bullish), while the hourly USD spot index was at 49 levels (mildly bullish) at 11:22 GMT.